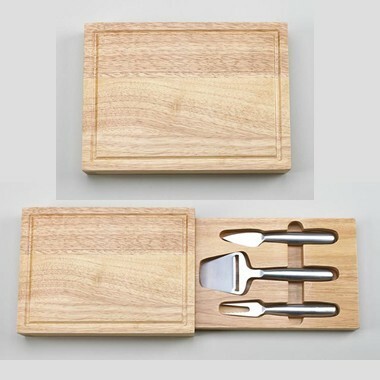 Description: This rubber wood cutting board holds a secret - a pullout drawer the has 3 stainless steel cheese tool inside. The wood is from cultivated rubber trees, a renewable resource. The tools, ranging from 7" x 8.5" long, feature stainless blades and forks. Want to make this gift really unique1/3 Add a monogram, name or special message.